1 How much do you charge for samples? 2 How big is the pattern repeat? How heavy are the fabrics? How resistant are the fabrics? 3 What are the blankets and cushions sizes? 4 Are the cushions filled? With what material? 5 Can I order a blanket in a special size? 6 What size am I? 7 How can I order from Melin Tregwynt? 8 Where can I buy your products? 9 Can I use Melin Tregwynt fabrics for my curtains? 10 How do I place an order for a present? 11 How do I take care of my Melin Tregwynt blankets? 12 What do I do if my woollens start pilling? 13 How do I take care of my Melin Tregwynt upholstery? 14 Where does the wool come from? 1. How much do you charge for samples? We usually do not charge for sending you up to 3 samples of fabric. Every sample in addition to the 3 free ones are charged £1 each. 2. How big is the pattern repeat? How heavy are the fabrics? How resistant are the fabrics? These measurements are for guidance only as the shrinkage of the fabric may vary. These figures are for guidance only as the shrinkage of the fabric may vary. If you need a precise weight, please contact us so that we can weigh the fabric in stock when ordering. Wool by nature is fire resistant. Upholstery fabrics: fire tested to BS5852 and passed to comply with The Furniture and Furnishings (Fire) (Safety) Regulations 1988. All upholstery cloths are Fire/Flame Retardant (FR) to BS 5852 Schedule 4 Part 1 (Cigarette) and BS 5852 Schedule 5 Part 1 (Match). This is a legal requirement which deems them suitable for Domestic use. Also, all our upholstery cloths are treated and tested to BS 5852:2006 “Methods of Test for the Assessment of the ignitability of upholstered seating by smouldering and flaming ignition sources” using ignition source 5 (wood crib) and meet the performance requirements of BS 5852:2006 Ignition Source 5. In terms of abrasion, the higher the rubs, the more hard wearing the fabric is. For customers who want a fabric with more wear and tear, we would advise them to purchase a fabric with higher rubs. The blankets and cushions sizes for each design are detailed in the catalogue and online but please allow for a +/- tolerance margin of 5% on all sizing. Blankets and throws are textile products and are affected by changes in temperature and humidity. Our blanket sizes are very generous. To use a blanket as a decorative throw over the end of the bed, we recommend you choose the next size down, i.e. use a single for a double bed. Otherwise to make sure, you can measure a bed sheet, and once you are happy with its dimensions on the bed. We can make a size to order if necessary. Please refer to Special commissioned and bespoke items for terms and conditions regarding special sized items. We only STOCK three sizes of cushions: a large cushion (45x45cm), a decorative small cushion (30x30cm) and a rectangular cushion (30x60cm). We can make covers to fit different sized pads as a special order. Please refer to Special commissioned and bespoke items for terms and conditions regarding special sized items. The retail prices include the cushion pads which are filled with small feathers for comfort as standard. Wide width weaving of blankets, throws and bedspreads is our speciality, along with multishaft and doublecloth weaves. Our fabrics are woven on looms in widths from 150cm up to 260cm. We can offer special sizes made to order and limited only by the width of your chosen fabric. Please refer to Special commissioned and bespoke items for terms and conditions regarding special sized items. We can supply meterage of all our cloth (in 10cm increments). Please be aware that we will not be able to refund you unless the fabric is defective. 6. What size am I? We publish the garment sizes so to help you choose, please use the guide below. Men’s chest (yellow line) – Measure around the broadest part of your chest, 1-2” below the armpit (over the shoulder blades). Women’s bust (yellow line) – Measure around the fullest part of your bust (over the shoulder blades). Men’s waist (orange line) – Measure about 1” below the pelvis bone. Women’s natural waist (orange line) – Measure around the narrowest part of your waist. Women’s low waist (pink line) – Measure around your stomach over the upper hip bone. Hips (purple line) – Feet together, measure over the fullest part of your bottom. About 20cm below your natural waistline. 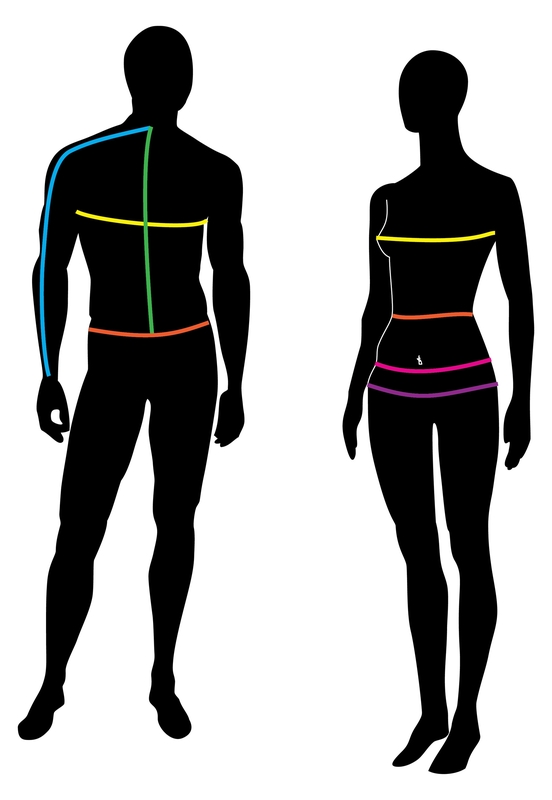 Body length (green line) – Measure from the centre back of your neck to the hemline. Sleeve length (blue line) – Measure from the centre of the spine at the base of the neck, around to shoulder, over the elbow (with your arm bent) and down to the wrist. Head circumference 22.0" 22.5" 23.0" 23.5"
Please note that you can download the PDF version of our latest catalogue and/or request one by post. You can now order online but if you wish a personalised service or for any enquiry, please phone us on 01348 891 644. Our office is open from Monday to Friday 9am to 5pm. Call 01348 891 644. Our office is open from Monday to Friday 9am to 5pm. This is the best time to call as we can give immediate advice about sizes, availability and delivery. Outside these hours please leave a message on our answer phone and we will get back to you. Fax the order form to fax line 01348 891 694 and we will get in touch. For your local stockist, please visit our website, or alternatively contact us directly. We will be very happy to help in any way we can. If you have any suggestions, comments or problems, do please email us at info@melintregwynt.co.uk. Some of our fabrics are thick and heavy and may limit the style of curtains you can have. Order by the metre bearing in mind you have the whole width to use. Fabrics from natural fibres do not always have a perfect alignment of the pattern and can drop over time. Please ring us on 01348 891 225 and we will answer your questions in the best of our abilities; but we will always recommend to contact a professional curtain maker as we do not make curtains ourselves. Always ask for samples and measure the width of your track not the width of your window. We will be happy to deliver the item to a different delivery address for a present. You will receive the invoice and the receipt and the present will be sent separately along with a card. We also offer a gift wrapping service which costs £5 extra. Please note that for products bought as presents, refunds can only be given to you, the original payer, and if the recipient decides to exchange an item, we cannot prevent you from being aware of the exchange. You can also choose to offer a gift voucher for the desired amount. They are purchased just like any other item we sell. You will need to specify the following: the name of the person you are sending the gift voucher to, the email address of the person you are sending the gift voucher to and the amount you want to give. Please ensure that you have given all of the information correctly. You can pay for them using our standard payment methods. Once purchased, the gift voucher will be sent to the gift recipient. You will receive the invoice and the receipt. The recipient can use the gift voucher received to purchase any of our products. Please note, you will still have to select another payment method if your gift voucher does not cover the cost of your purchase. The gift voucher will display a unique code on the front. When you place your order to redeem your gift voucher, please give us this code. Gift vouchers are only valid for one use. Once the gift voucher has been used (whether in an authorised or unauthorised manner) it will become void. The gift voucher recipient is responsible for ensuring that the unique code on their voucher is kept secret and is not used by anyone else. We strongly advise to use the total amount of your gift voucher as you may not be able to use the balance for a future purchase. If the order value is less than the gift voucher value no change or cash will be given. Vouchers have no cash value and cannot be exchanged for cash. All standard terms and conditions apply when placing an order using a voucher. Wool is a natural fibre, and as such is apt to stretch and move with use. We have tested our range of blankets and throws using different care methods. We hope that by taking good care of your woollens, you can enjoy our products for years to come. To clean your wool blankets, we recommend dry cleaning. This method best maintains blanket size, handle and appearance. Wool blankets can be washed; but this should be a cool, quick hand wash, and short spin, followed by a line flat dry. The fabric should be immersed in cool water and agitated for no longer than a couple of minutes. Leaving the blanket in even cool water for any length of time will felt and shrink the fabric. Water temperature should be no more than 30°C. Cold water works just as well. You can also wash them on a 30°C machine wool wash, with short slow spin. Remove damp item immediately spin cycle finishes to avoid creasing. Line flat dry. However, when continuously washed, the blankets experience up to 8.5% shrinkage and a slight felting in appearance, this makes the fabric become stiffer and denser, changing the soft handle and smooth appearance of the blanket. Natural fibres like wool may be subject to pilling and it usually comes away. The cause of pilling is abrasion. The fibres simply get damaged by friction and abrasion through either wear and tear, or whilst being washed. Pilling (or bobbling) can be removed by brushing, cutting or picking bobbles from the fabric. You can also use something sticky like sellotape to remove less entrenched pilling if not covering too wide an area. Alternatively there are specifically designed lint shavers available. All our upholstery fabrics have a ‘Low-Smoke Zirpro’ treatment applied to achieve greater flame resistance. To help extend the life of your Melin Tregwynt upholstery fabric, vacuum regularly – ideally every week – to remove accumulated dirt and dust particles. The following tips are purely recommendations and cannot guarantee complete stain removal. In all cases we recommend contacting a professional cleaning institute. Melin Tregwynt can accept no responsibility for damage caused by use of the following tips. Acting quickly when a stain occurs will give the best results; it is a good idea to keep relevant cleaning materials together in a convenient place in case of a spill. Do not rush or panic, but work patiently and thoroughly. For a wet or oil-based spill, quickly mop up any excess liquid using a clean absorbent cloth, tissue or sponge. Always blot or sponge the spill - never rub – and work inwards from the edges to avoid the stain spreading. Solid matter or any hardened residue should be scraped off with a spoon or scoop at the outset, and any loose particles vacuum cleaned. For non-greasy stains, a clean cloth wrung out in warm water can be used to carefully dab the stain until it disappears. For greasy stains, an appropriate detergent or solvent can be used. Only use professional cleaning services or reputable brands, and follow the maker’s instructions exactly. Always test any stain-remover on an inconspicuous area first in case of an effect on the cover. NEVER try to remove the stain with household detergents or detergents intended for hard surfaces. Do not over-wet the fabric but use small amounts of cleaning liquid at a time, and blot in-between applications. Make sure to dry the fabric fully before use. It may also be necessary to use a hairdryer to avoid leaving edge marks. If the stain cannot be identified or removed, seek expert advice from a reputable dry cleaning organisation. The majority of British mills have not used local fibre since the decision was made to centralise the buying and grading of wool, in order to improve the quality of yarn available and the fabric produced. Henry Griffiths who started the business was upset by this as he saw the loss of the connection to the local farming community. Howard Griffiths (second generation) who was a good businessman saw it as an opportunity to buy wool when he needed it and not when the local farmers had clips available, and also an opportunity to be able to choose the quality of wool that he needed for the end market. They were both right. As a business we have benefitted from this decision. We have a freedom of choice of supplier and quality of wool. We buy wool from British suppliers but in effect that wool comes from all over the world. We are a global business and are part of a supply chain that covers the world. The people who have really suffered are the farmers who are at the bottom of the supply chain and whose wool is often seen as a waste product not the valuable commodity that it actually is. The balance needs to be redressed and the Campaign for Wool which promotes Wool (not just British wool) is just the beginning. There are signs that spinning is coming back to the UK. Until recently wool spinning had been outsourced, like most British manufacturing, and took place outside the UK. So many factories & specialist yarn spinners closed in the manufacturing recession of the 80’s/ 90’s. Now spinning plants are being re-opened. The UK has never produced lambswool of the quality of Australian or New Zealand flocks (our sheep are mostly bred for their meat) but we hope that wool will once again be available from British flocks. A perfect successful example from Wales is the Cambrian Mountains Wool which is supported by the Cambrian Mountains Initiative (CMI). The Initiative, inspired by HRH The Prince of Wales, aims to help sustain traditional upland farms and rural communities of Wales. Cambrian Mountains Wool products will reflect the ethos of the CMI – adding value to traditional farms, offering the highest quality local produce and reconnecting people to the natural world and the area’s rich wool textiles heritage. It looks like over time UK yarn will again become available to meet the more niche needs of a smaller & more specialised manufacturing base. However these are infrastructure projects and are capital intensive to set up. A lot will depend on the demands of the consumer market. If they decide that locally sourced yarn is a good thing it will happen. Some of our recent projects have allowed us to use yarn from the wool of different British breeds of sheep including the Herdwick and Jacob. We are working on an exciting project using yarns from the Welsh Cambrian sheep with the Cambrian Mountains Initiative (CMI). This yarn is composed of 100% pure new wool of average micron 25. The fibre is sourced from New Zealand and South America. The yarn is soft and slightly chunky which makes it perfect for use in our classic style blankets - Broadstripe and Ysbryd. It also makes a heavier-weight fabric in our doublecloth patterns St. David’s Cross and Vintage Star. This yarn is composed of 100% pure new wool of average micron 29, and the fibre is sourced from New Zealand. This yarn is coarser and chunkier than the other yarns we weave and is used to make heavyweight hard-wearing fabrics suitable for upholstery, bags and outerwear. The fabric is ‘blown’ and ‘decated’ in the finishing process which creates a smooth flat finish, which is quite a different handle to the fabric straight off the loom. The designs we use this yarn in are Elements, Nexus, Halo, Vintage Rose and Semi-Plain. This yarn is composed of 100% Merino Lambswool of average micron 20.5. The fibre is sourced from South America and South Africa. The yarn is particularly soft and fine, resulting in a fabric of soft lightweight handle. Originating in Spain, most Merino sheep are now bred in Australia, New Zealand and South Africa. We use this yarn in the following designs - Knotgarden, Madison, Carew, Mondo, Multistripe and Patrwm Patagonia. 90% wool and 10% nylon. A fine 18/2nm yarn to resist abrasion for severe contract applications. We are currently working on a fabric range using 100% Welsh wool, in conjunction with Cambrian Mountains Wool CIC. We hope to be launching this range within the next year. Cambrian Mountains Wool CIC is a Community Interest Company established in 2016, in order to facilitate the purchase and processing of wool produced on the farms in the Cambrian Mountains region of Wales, for commercial use. In 2008 HRH The Prince of Wales set in place the Cambrian Mountains Initiative, one of four rural Initiatives aimed at supporting and developing the upland farming communities in the UK. Support from this Initiative – along with the skills of local farmers, the British Wool Marketing Board and Curtis Wools Direct – enabled Cambrian Mountains Wool CIC to develop their idea into product. Alongside the development of the yarn itself, other aims of the company include the promotion of designers and makers using locally sourced wool, and engaging with local communities to encourage traditional textile skills and to raise awareness of the region’s wool production. We are excited to be involved in the development of this new Welsh wool into a weaving quality. It is a fantastic opportunity to be able to return to the roots of Welsh weaving; combining locally sourced yarn with beautiful design in order to create a premium Welsh product for our customers. The Campaign for Wool will help as it lends credence and support to something we have always done and will continue to do i.e. weaving in wool in the UK! If it helps to produce better quality UK yarns this can only be beneficial. If farmers can get a better price for fleeces and the public begin to appreciate the costs and benefits of keeping skills & traditions alive then the rural economy and British manufacturing will all be helped. We can’t afford to lose those skills as without the tradition of actually weaving the cloth, design and technical skills will also go and a skills base of designing and weaving in wool will have been lost forever.